Who needs a song book when you have the Bible! I ran across a list of songs from scriptures in God’s Word and the songs reminded me so much of a small country church I attended for 16 years… many years ago. Each week we sang songs straight from scriptures and while doing this the Word of God became imprinted in our hearts and minds. Singing and praying scripture is a wonderful way to feel the presence of the Lord! How many of these songs do you know? God amazes me SO MUCH how He directs our lives!!! He has taught me over the years to pay attention to who I meet and how I respond to them because we never know what the future may hold for those you come in contact with on a daily basis. About six or seven years ago I met a waitress at Bennigan’s who at the time reminded me so much of a famous actress. I asked her if anyone had ever told her she looked like this person before and she laughed and responded, “daily”! We began talking and as she was getting off work I asked her if I could pray for her about some things we discussed. Well, fast forward to 2010… “facebook world” where a very special friend request popped up on my e-mails. It was hers!!! This young lady saw my name and picture on a mutual friend’s page. (FYI – Neither one of us knew the other one knew this friend until this time.) She asked me if I remembered praying for her at the restaurant and as soon as I saw her picture I remembered. The main part where God AMAZED me about this particular situation was when I saw a prayer request on her profile page and the nature of this request. Her newborn son is scheduled this Monday, May 10th for heart surgery. Little did she know I just walked through a similar surgery with our first grandchild and my daughter and her husband this past year. Our grand-daughter had an interrupted aortic arch and a hole in her heart. She was flown to Children’s Hospital in PA immediately after birth for her rare heart surgery. She is now 11 months old and doing beautifully! Praises to our Lord and Savior for our little miracle girl! When we walk through life changing events we never know how God will use our experiences. I believe six or seven years ago God knew ahead of time we would meet again via internet and have similar experiences where encouragement and prayer could be given. I don’t want to miss an opportunity to be a part of what God is doing and to answer God’s call at this time for this situation! I’m writing this about her family anonymously (for their privacy) since I’m placing this on every internet outlet I have. What I’m asking everyone reading this to do is to please fast and pray this Monday, May 10th for this precious and adorable little baby boy. God knows his name and the parents… so please pray specifically for a successful surgery and for all the medical professionals caring for him every single moment. The issues he has been diagnosed with is a “Double Outlet Right Ventricle” heart. His Pulmonary Artery is narrowing so they will correct that in surgery. They will also connect his aorta to the Right Ventricle so that it will start getting only Oxygenated (Red) blood (as it should be…). Right now the blood is mixing making the heart work harder to sort it out. Through surgery his VSD will be corrected as well as an ASD (hole between his L and R atriums) He also has a Right Aortic Arch. Some of the prayer and scriptures below were written by my daughter and adjusted by me to fit this baby boy’s situation. We used the scriptures while praying for our granddaughter. God is no respecter of persons. Like He provided healing and care for our granddaughter He can provide healing and wonderful care for this baby as well. We believe in the healing power of Jesus Christ! Thank you in advance for your prayers and concern for this family. God directs our lives and following His leading is such an awesome experience!!! Also, guess what? When you pray…you become a part of this MIRACLE!!! http://jaimecmitchell.blogspot.com/ Sweet Jaime sent me a note with permission to use their name. Here is the link to her beautiful blog with the story of her sweet family. (Go to Dec. 09 to start their story) Please continue to pray for their baby “Cash Mitchell”… I just edited the prayer above to include his name. Talk to God… spend time with HIM… HE will show you what to do! Ephesians 4: 2 & 3 reads… Be completely humble and gentle; be patient, bearing with one another in love. 3. make every effort to keep unity of the Spirit through the bond of peace. Cross Reference: Colossians 3:12 ~ So, as those who have been chosen of God, holy and beloved, put on a heart of compassion, kindness, humility, gentleness and patience. What a WONDERFUL God we serve to speak His Word to us in such a special way! This made my day!! …now to live it! This is the true test. He gives each one of us a choice of what to do each day. We just need to make the CORRECT choice! Thank you Lord for showing me how to live out my life for you. Please continue to direct my path! Over the years I have had the privilege of knowing many influential and knowledgeable people and valued their opinions on different matters. However, none have I thought had ALL the answers in my life’s journey. I couldn’t go to sleep at night putting my trust completely in them. Talking to the LORD and awaiting HIS direction is the best advice I could give anyone. Now, I am human and have learned from previous mistakes where I went into situations blindly without waiting on the LORD. This was a mistake and I had to live with the consequences. Sometimes we look to man to solve our problems whether the issue be for a job, health insurance, heart issues, moral issues, family etc… however, scripture tells us that man is not immortal. He does not have all the answers. Isaiah 2:22 reads ~ Stop regarding man whose breath of life is in his nostrils; for why should he be esteemed. Also Psalm 146:3 ~ New Living Translation reads ~ Don’t put your confidence in (powerful people); there is no help for you there. Powerful people is just one phrase used in this New Living Translation. Among several translations I have found such examples as: Princes, influential people, rulers, children of men, and nobles. One cross references of this scripture is Psalm 118:8 ~ It is better to take refuge in the LORD than to trust in man. We do need to value the opinions of wise men and women but they are just that… opinions. The WORD of God is TRUTH and offers the help and wisdom needed to make the wisest choices. Sometimes we are to… be still and know HE is LORD (Psalm 46:10). We pray and seek God for the answers and wait for direction. Oh, how hard it is to be still at times and wait… but the answer will come and be so much better by our waiting. The other day I was reading Proverbs 3:5-6 ~ Trust in the Lord with all your heart; and lean not unto your own understanding. In all your ways acknowledge him, and he shall direct your paths. If you really think about this scripture you may see that some key words are IN ALL YOUR WAYS ACKNOWLEDGE HIM. How do you do this??? When things are going your way acknowledge the Lord who has directed you. When things are not going so well acknowledge the Lord has been with you through everything you’ve been through. When you don’t know what to do acknowledge the Lord has your best interest at heart and will direct you. When you need an answer acknowledge God’s Word has the answer. In all your ways acknowledge HIM and HE will direct your paths! HE will make your paths straight! HE will be there for you! When salt is left on the earth or exposed to the sun, rain, and air it loses its flavor and becomes worthless. If a seasoning has no flavor, it has no value. Why even have it a part of your meal or snack if there is not a difference of whether you add it or not? Salt is a seasoning and preserving chemical but if the product has no flavor then it becomes worthless. As Christians if we are too much like the world we lose our effectiveness and uniqueness to make a difference. So why should a person choose to be a Christian if there is no real difference from someone who is a non-Christian? We should not blend in with everyone but we should make a positive difference everywhere we go. We need to be an effective Christian. Just like seasoning brings out the best flavor in our food, we need to bring out the best in everyone we meet. [ Salt] “You are the salt of the earth, [Mark 9:50; Luke 14:34] but if salt has lost its taste, how shall its saltiness be restored? It is no longer good for anything except to be thrown out and trampled under people’s feet. My hearts desire is to add seasoning to my life to become more effective…. Keep my eyes on HIM! WOW! God has once again opened my heart to His power and the evidence of our belonging to HIM. My heart and life are SEALED by HIM and no other! By belonging to Him I have access to ALL that belongs to HIM and to EVERY promise in HIS WORD. 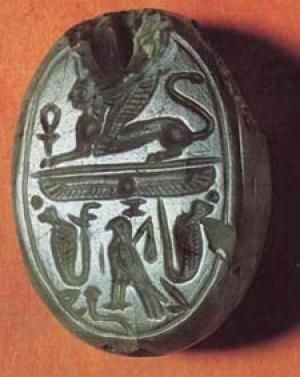 To confirm ownership a seal was used in the ancient world. To your left is a picture of an ancient Hebrew seal which is believed to be owned by Jezebel, the wicked Queen of Israel. Seals were usually made of hard stones or metals with an engraved image on each one to indicate a persons worth or possessions. In research I found a seal usually had the engraving of a diety (god), a hero or a portrait. Slaves and livestock were marked as possessions by their owners with a family seal just like we brand cattle today to show their ownership. In some cases people claimed to be owned by a diety (god) and wore the seal of their god. The one TRUE God has marked His possessions as well! We as believers are marked (SEALED) by God Himself. His SEAL does not leave a physical impression on us… however, His SEAL (of the Holy Spirit) is as a sign of you belonging to Him. As you demonstrate your faith you show others who you belong to. What does God’s SEAL mean to me and you? 1) The Holy Spirit (SEAL) is a guarantee of the full experience of salvation. 2) The SEAL is a guarantee He will do what He promised in His Word. 3) His SEAL is like a binding contract with each one of us. 4) His SEAL lets others know who we belong to. 5) His SEAL secures… (is the evidence) of eternal life for us. 13In him you also, when you heard the word of truth, the gospel of your salvation, and believed in him, were sealed with the promised Holy Spirit, 14who is the guarantee of our inheritance until we acquire possession of it, to the praise of his glory. 13 And now you Gentiles have also heard the truth, the Good News that God saves you. And when you believed in Christ, he identified you as his own by giving you the Holy Spirit, whom he promised long ago. 14 The Spirit is God’s guarantee that he will give us the inheritance he promised and that he has purchased us to be his own people. He did this so we would praise and glorify him. Showing others the SEAL of God (through the Holy Spirit) is the evidence needed to confirm who owns your life. Signed… Sealed… Delivered… I’m Yours God! In the midst of praying this evening… my heart became thirsty for more of God. The room was quiet, the lighting was dim, however my heart was full and a light flooded from within like I haven’t experienced in months. In the background I heard playing on the CD player, Hillsongs’s Worship CD, “Overwhelmed”. I stopped and listened and left myself and my agendas behind along with all MY desires to follow HIS desires. The song playing was “Hear Our Prayer” http://www.youtube.com/watch?v=TEkX0tBUW2I which describes a deer panting beside the waters as the heart yearns for more of God. A desire came from within me to start blogging again and to express the call God has placed on my heart to minister to others. When you seek God and thirst for Him… HE will quench every dry place inside you. He’s calling you back to HIM…. listen. What has God been telling you lately?